A hazy morning greeted us when we woke up, however this did not deter us from exploring the rich and colorful cultural sites of Macau. One good thing for tourists in Macau is that you can explore the city using free hotel/casino shuttle bus. We maximized the use of different casino shuttles through out the duration of our Macau vacation. Not a single cent was spent on taxis and public buses to tour around. The Venetian Coach bay operates from morning to evening, with free shuttles going to and from China border gate (Zhu Hai – Macau border), Four Seasons Hotel, City of Dreams, Sands Hotel and Ferry Station in regular timings. The shuttle timings are so frequent that you do not need to wait for 5 minutes to catch a ride. Our itinerary for the day is to explore the cultural sites downtown, so we hopped to a Venetian shuttle going to the Macau Ferry Station. The ride is very comfortable and it only took us about 20 minutes to reach the ferry station. There is a big coach bay just outside the ferry station with shuttles going to various hotels and casinos. Before switching shuttles in the ferry stattion coach bay, we headed first to the Visitor’s Center inside to get some maps. We rode the shuttle going to Grand Emperor hotel which is one of the nearest hotels to Senado Square. The Grand Emperor hotel is just a cross New Yaohan Mall and a block away from the main street Ave. Infante D. Henrique. We navigated towards Senado Square using the free map we got from Ferry Station’s visitor center. Remember, you have to walk towards Ave. Almeida Ribeiro (or commonly known as San Ma Lo road) from Ave. Infante D. Henrique to reach Senado Square. Senado Square is the heart of the cultural district of Macau. The site is very well known for its cobble stone walks. From here, you can walk by foot to Leal Senado, Holy House of Mercy, Cathedral, Lou Kau Mansion, St. Dominics Church and St. Paul Ruins. There are numerous street signs and street maps within the area on how to go to these places. The place is also compact, you will not get lost. You can finish touring around the area for less than two hours. The street going towards St. Paul Ruins becomes narrower and crowder as you go a long. 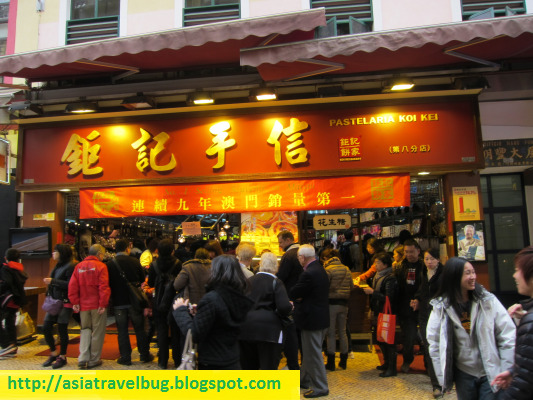 The street is very busy with shops selling local delicacies including the famous Macau Egg Tart. The vendors are very kind to give you free taste of almond cookies, pork jerkies etc but not very pushy to get you buy their products. We bought local delicacies from Pastelaria Koi Kei. At the end of the street, you will reach St. Paul Ruins. Heading to Hong Kong? You might find my Hong Kong blog useful.